What’s Happening This Spring in Bethel’s History Department? This morning marks the beginning of the Spring 2019 semester at Bethel. What’s happening this spring in the History Department? • Dr. Poppinga is taking a well-earned sabbatical, as Dr. Kooistra returns from her fall away from Bethel. • We have our largest enrollments ever in both Intro to History (30 students joining Dr. Magnuson) and Intro to the Digital Humanities (20 with Dr. Goldberg). We’ve also got full houses in American Civilization, World War II, Human Rights in International History, and History of China, Korea, and Japan. • Eleven students will be completing their History majors in Senior Seminar with Dr. Kooistra. Look for them to present their capstone research projects in May. • Those seniors will also be participating in the 2019 edition of the Minnesota Undergraduate History Symposium, coming back to Bethel on Saturday, April 27. Author Chris GehrzPosted on February 4, 2019 Categories About Faculty, Amy Poppinga, China Korea & Japan, Courses, Intro to Digital Humanities, Intro to History, News & Announcements, Senior SeminarLeave a comment on What’s Happening This Spring in Bethel’s History Department? Congratulations to Prof. Amy Poppinga, who has an article published in the newest issue of the journal Christian Higher Education. With Bethel colleagues Sara Shady (Philosophy) and Marion Larson (English), Dr. Poppinga draws on her scholarship in the field of interfaith studies and her experience with interfaith initiatives at Bethel to suggest how Christian college students can develop interfaith competency. While Christian higher education provides a valuable space for students to grow in faith and prepare for lives of service to others, many students leave college with little exposure to, or knowledge of, religious differences. Of particular concern is the infrequency of students developing relationships with religious “others,” leaving them underprepared for constructively navigating a post-Christian society. This reality places a special responsibility on Christian educators to provide sound education and opportunities for healthy encounters with different religious voices, allowing persons from these traditions to speak in their own voices and be hospitably welcomed into Christian communities. Amy Poppinga: It is hard to believe we are already back to school. I had a wonderful summer that consisted of research and writing, quality time with my immediate and extended family, and some personal time with friends. It started with me traveling with my closest friend from Bethel on a trip to Costa Rica to celebrate our 40th birthdays. We attended a week-long women’s surfing camp. It was hard work but I loved it! We met as students in the History department, and I am grateful for our enduring friendship despite many moves, job and life changes. Then along with my good friend and colleague, Sara Shady, I received two grants to work on creating a new course for Bethel’s Pietas Honors Program. The course centers on community, spiritual identity, and interfaith engagement. Keeping with my continued interest and research in the field of Interfaith Studies, I just co-authored an article, “Building Bridges Across Faith Lines: Responsible Christian Education in a Post-Christian Society” with Marion Larson and Sara Shady for the Journal of Christian Higher Education. 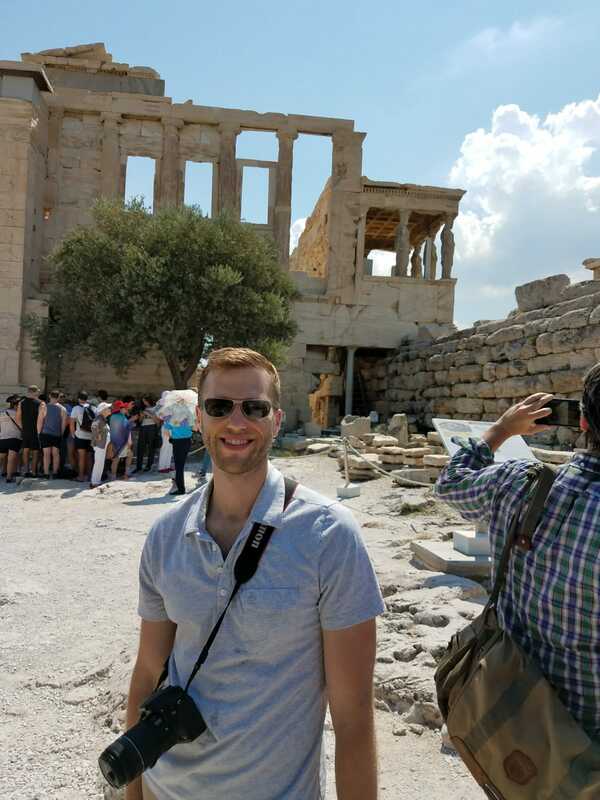 Charlie Goldberg: I was thrilled to have been selected to travel to Greece for nine days to participate in a seminar on fostering an appreciation for the classics in undergraduate education. The seminar was run by Harvard University’s Center for Hellenic Studies in conjunction with the Council of Independent Colleges. Along with nineteen other college professors and trip leaders Greg Nagy (Harvard University) and Kenny Morrell (Rhodes College), I toured the Peloponnese and spent time in Delphi and Athens. The group discussed strategies for raising appreciation for the classics and ancient history at small colleges, shared lesson plans, and made plans for future collaborations. I also shared my experience launching Bethel’s new Digital Humanities major with others interested in similar efforts at their home institutions, and will forever appreciate the lifelong professional and personal relationships I forged on the trip. Diana Magnuson: I continued to collaborate with two historians at the Minnesota Population Center (U of MN). My paper with Steven Ruggles, “Capturing the American People: Census Technology and Institutional Change, 1790-2020,” was submitted in July to an American history journal. Our paper was accepted for presentation at the Social Science History Association annual meeting in Phoenix (November 2018) and will also be presented in October at the Office of Population Research, Princeton University. We have another project underway researching the history of privacy and the U.S. Census. Then Ronald Goeken and I are expanding our research to include all major census recounts. Sam Mulberry: I spent this summer getting back up to speed with normal Bethel work after my Spring 2018 sabbatical. I had two major projects on my plate. First, I worked to build academic schedules for incoming students who will be new to Bethel in the Fall. This included both building their initial schedules as well as meeting with students throughout the summer to make changes and adjustments to their schedules. Secondly, I taught CWC (GES130) online with Chris Gehrz and Amy Poppinga. This was my sixth straight summer teaching this class. Although everything in the class went really smoothly, I did spend a chunk of the summer starting to think through how the next iteration of the class might look. One of the places Prof. Gehrz preached this summer: First Congregational Church in Litchfield, Connecticut, whose oft-photographed building dates to 1829. Chris Gehrz: This summer break was incredible! I spent the first five weeks of break out east, mostly doing research for my new Charles Lindbergh biography. I started at the Library of Congress (holding an impromptu alumni reunion along the way) then spent a month back at my graduate alma mater, Yale University, home of the Lindbergh Papers. While I was in the Northeast, I also had the chance to preach at three churches in Connecticut and Massachusetts, as a follow-up to my 2017 book, The Pietist Option. Meanwhile, I found time to walk the Freedom Trail in Boston, see my first game at Fenway Park, and visit Plymouth Rock. But the true highlight of my summer came in mid-July… On my way back to the Midwest, I detoured to southwestern Virginia for a week to take part in the celebration of my dad’s retirement, after 45 years of service as a pediatrician and medical researcher. There was agreement that the last hour of the evening had, indeed, been uncomfortable. While they were certainly taking that discomfort seriously, a few days of distance allowed them to laugh about the awkwardness of the encounter and consider it from different angles. Students spoke about the need to not be defensive but rather to be okay with operating from a posture of learning. One commented that he could only imagine what it would be like to have the tables turned, and to be a Muslim listening to a Christian defend their theology in contrast to Islam. “I’m sure that happens a whole lot more often than what happened to us,” he remarked. A few students then began to discuss their own struggles with aspects of Christian theology, and an almost confessional atmosphere was created as some expressed the difficulty of articulating faith and truth claims. Along with her Bethel colleagues Sara Shady (Philosophy) and Marion Larson (English), Prof. Poppinga helped coordinate the event, which drew about 80 students (15 from Bethel) to the University of St. Thomas in St. Paul. (Bethel and St. Thomas co-sponsored the event with Augsburg University.) The conference was the latest in a series of interfaith collaborations for the three Bethel professors — and an extension of themes from Prof. Poppinga’s research and teaching (in courses like HIS212U History of Islam, HIS328G Muslim Women in History, and HIS356 Modern Middle East). In addition to coordinating, Prof. Poppinga led a breakout session on Moving into One Another’s Stories. The conference was funded by a grant from Interfaith Youth Core, whose president, Eboo Patel, will speak at Bethel on Monday morning, April 9. This summer, Sam Mulberry be working at Bethel on three major projects. First, he’ll help build academic schedules for incoming students who will be new to Bethel in the Fall. This includes both building their initial schedules as well as meeting with students throughout the summer to make changes and adjustments to their schedules. Secondly, Prof. Mulberry will be teaching Christianity and Western Culture (CWC) online with Chris Gehrz and Amy Poppinga — his fifth straight summer teaching this class. Finally, Prof. Mulberry will be working on several major video production projects: a series of digital study skills workshops; a new online Tutor Training for Bethel’s Academic Enrichment and Support Center; a video archive of exit interviews with students of color who have recently graduated from Bethel; and a short interview film with faculty who were on Sabbatical during the 2016-17 academic year. Amy Poppinga is off to Montana in early June with her family for ten days of touring, horseback riding, fishing, and white water rafting in Glacier National Park. Upon her return she will be working to implement a grant she and colleagues Marion Larson and Sara Shady received along with faculty from the University of St. Thomas and Augsburg. The campuses will be working together to host an interfaith leadership conference for students in February 2018 at St. Thomas. In the meantime, Poppinga, Larson, and Shady are waiting to hear news regarding another grant for interfaith competency training for faculty and staff at Bethel. They are also working to submit a proposal for the CCCU International Forum in 2018. She will also be resuming edits on her dissertation, and teaching online Summer CWC with her colleagues, Sam Mulberry and Chris Gehrz. 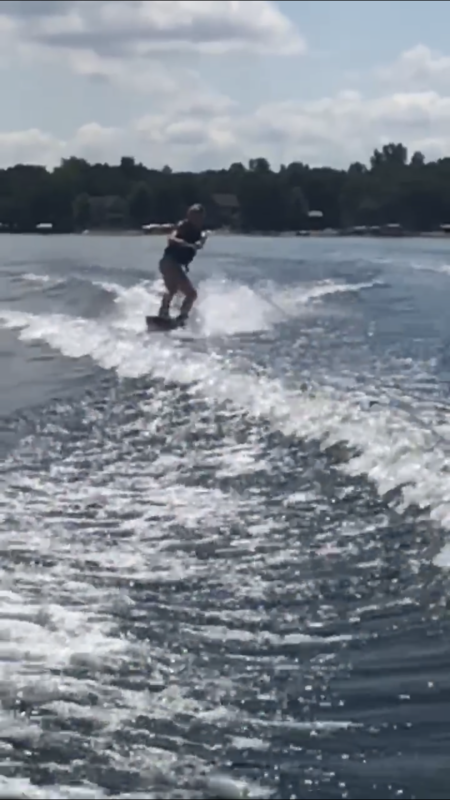 When she’s not working on any of the following, she can be found watching her sons play baseball or spending time on her paddleboard at the family cabin in Alexandria, Minnesota. Thanks to the vision and energy of Prof. Sam Mulberry, members of our faculty have been podcasting for a decade — long before the medium really took off. (We even had our own departmental podcast for a couple years.) Now Sam is joined by two of our professors and several of our disciplinary neighbors, for a new podcast network he calls Live from AC2nd. • The Live from AC2nd flagship, a wide-ranging, roundtable discussion featuring a mix of faculty that includes Sam, historians Amy Poppinga and Chris Gehrz, political scientist Chris Moore, and philosopher Sara Shady. On their most recent episode, those five shared books they’re currently reading. • Moore and Mulberry also occasionally join Poppinga for Amy Makes Us Try Stuff. Which is pretty much exactly what the title says. For example, on the debut episode, Amy “made” Sam and Chris try the TV series Justified. • Predating the network itself is its most popular pod, Election Shock Therapy, an ongoing conversation about politics and government featuring Chris Moore and fellow political science professors Andy Bramsen and Mitchell Krumm. The most recent episode dissected Pres. Trump’s first address to Congress. • And the newest member of the Live from AC2nd lineup is Nothing Rhymes with Gehrz, in which that Chris joins Sam to riff on six words that, well, don’t rhyme with Gehrz. Last Friday’s pilot episode featured everything from a rumination on the importance of wondering for teachers to a preview of likely upsets in the upcoming NCAA men’s basketball tournament. You can listen to or download individual episodes at the Live from AC2nd homepage, or subscribe at iTunes. Wednesday’s Webisode: A Usable Past? Episode five of Past & Presence is now available! It’s the first to be hosted somewhere beyond Bethel’s campus — at Bethel’s former campus across from the Minnesota State Fairgrounds in St. Paul! Plus look for an interview with alum/prof Amy Poppinga ’99, an ad for Diana Magnuson’s American Beginnings course (returning this fall), and information for students who might want to continue their studies in seminary. Author Chris GehrzPosted on March 4, 2015 Categories About Faculty, American Beginnings, Amy Poppinga, Courses, Education after Bethel, From Students, Past and Presence, SeminaryLeave a comment on Wednesday’s Webisode: A Usable Past? Probably the most notable change is that we’ve created a new course, HIS290 Introduction to History, as a requirement for both majors and minors. Blending face-to-face instruction (a two-hour Monday evening seminar) with online elements (weekly department webisodes and a course blog), HIS290 will introduce students to the theory and practice of history as a discipline, with particular emphasis on how Christians engage in study of the past and connections with vocation and career. You can read more about it at Prof. Chris Gehrz’s blog: first this introduction, then this update on what he and colleague Sam Mulberry did this summer to prepare for the webisode series, Past & Presence. Students will continue to study history from multiple regions, taking two courses each from U.S., Global, and European (ancient, medieval, and modern) categories. The most important change here is in doubling the Global requirement from one course to two — at least one of which (as in the other two categories) needs to be 300-level. It has been interesting to develop my course curriculum this summer in the midst of the daily news, dominated by the struggles facing the region we will be studying. At the same time, I think students will be challenged by our need to stay on top of current events weekly, and will be enriched by building their knowledge of both the history and cultures of the countries of the Middle East. It has been hard to narrow down the selection of films and documentaries we will draw from and I am looking forward to having students assist me with determining which of these media resources will be most helpful for the students following in their footsteps. To me, that is one of the most exciting things about being a part of an inaugural course. This first group will inform how the course develops over time and I hope that these students will be excited by that opportunity. • Chris Gehrz will be speaking at two gatherings of Christian scholars later this month. As part of the Bethel delegation participating in a colloquium for the Christian College Consortium, he’ll present a Pietist perspective on Christ-centered higher education. Then a few days later he’ll fly to California for the biennial meeting of the Conference on Faith and History (CFH), speaking as part of a panel on how historians use social media and moderating a discussion of how historians help institutions manage change. Also this fall, Chris will appear at the Minnesota Genealogical Society in early November to give a talk on Polish history during and after the Cold War. Then early next year IVP Academic will publish The Pietist Vision of Christian Higher Education: Forming Whole and Holy Persons, a collection of essays by current and former Bethel faculty that’s edited by Chris (who also wrote the book’s introduction and conclusion). We’ll have more as the release date (1/5/14) gets closer, but you can read lots about that project at Chris’ blog, The Pietist Schoolman. • In her role as director of archives for the Baptist General Conference and Bethel University, Diana Magnuson will play a leading role in two events this fall at Bethel Seminary: the dedication of the Virgil A. Olson Stained Glass Windows Memorial (Friday, October 10, 3pm — in conjunction with the biennial meeting of Converge Worldwide) and the installation of the Herb and Jessie Nyquist Memorial Collection at the Seminary Library. As part of her Spring 2015 sabbatical at the Minnesota Population Center (MPC), Diana is scheduled to present her research at the February 9th installment of the MPC Seminar Series.